17th June, Macau: Rickle Kam of Hong Kong and Tang Joh Six of Malaysia were crowned ABF Tour Macau 2012 champions after both had lucky breaks in Round 2 with narrow victories over their opponents. Rickle Kam, who narrowly edged Hussain Al Suwaidi of UAE, 162-152 in Round 2, sailed past Ryan Lalisang of Indonesia, 254-187 in the second men's semi-final match to reach the final. In the final match, Hengky got off the mark with three consecutive strikes to open up a gap of 33 pins as Kam opened in the third frame. The Indonesian's gap was reduced slightly as he had a split in the fifth frame. Kam then rolled a turkey putting Hengky under pressure and causing him a split in the eighth frame. Kam ended with 197 to seal his first-ever tour title. Hengky needed a double in his last frame to take the match but was unble to turn it in. Hengky ousted Kam's team-mate, Wicky Yeung 172-147 in the first semi-final to advance to the title match while Kam trashed Ryan Lalisang, 254-187 in the second semi. 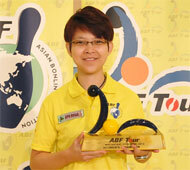 The runner-up also beat Macau Open champion, Yannaphon Larpapharat of Thailand, 190-175 in the opening round. In the women's division, Tang Joh Six denied last year's champion, Julia Lam her second home tour title after the Malaysia beat Lam, 194-177 to win her fourth career tour title. 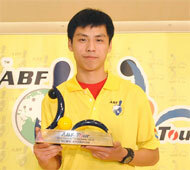 Tang also won the 2009 ABF Tour Tournament of Champions crown in Indonesia. Although Tang had edged tour debutant, Leong Mei Sheung of Hong Kong, 188-184 in the first semi-final, the champion had a narrowest of victory over Macau's Chan Weng Hang, 149-146 in Round 2. Leong outsed top seed and newly-crowned Macau Open champion, Chan Weng Sam, 198-177 in her opening round while Tang had an easy win over Macau's Um In Cheng, 185-157 in the first round. Mr Fong Wan Man, President of the Macau-China Bowling Association gave away the trophy to the women's champion while Mr Liu Chu Un, Department Head of the Macau Sports Development Board presented the trophy to the men's champion. The next ABF Tour stop of 2012 will shift to Jakarta, Indonesia on October 8 before the final stop in Riyadh, Saudi Arabia on December 22. Bowlers earn points in each of the leg contested and the top 16 men and top 16 women in the rankings will qualify for the ABF Tour Tournament of Champions.